Like pigeons, parrots flock to certain areas in vast numbers. Thousands of parrots land in known roosts in Gabon. Less is known about the interior forests of Congo, but the parrot swamps on the border of the Lomami are known to at least one parrot merchant. Parrot merchant in his capture camp near the Lomami River. 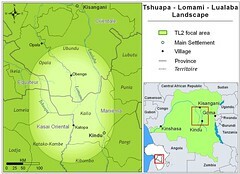 The roost is in an area that will become buffer zone surrounding the future Lomami National Park, a zone where we hope the ICCN (Congolese Park Service) will soon have both wherewithal and authority to forbid all parrot capture. Not yet though. 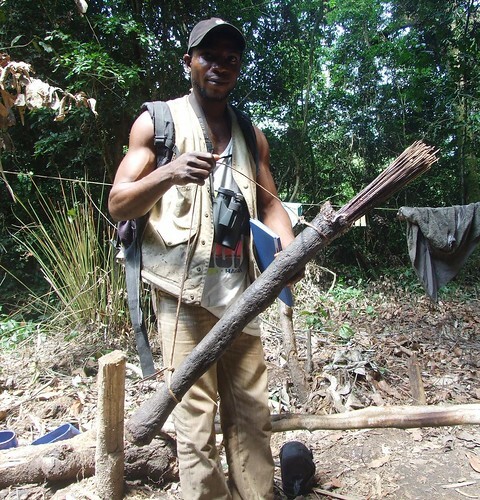 The parrot merchant from Kindu with his four climbers from the forests of Equateur had no reservations about setting their “traps” on the banks of the Lomami this past March. With permission from one province, he jumped the border into another province, paid off a local chief and was at ease. The capture camp was full of parrots tethered to holding pens, branches and shrubs. When one of our TL2 teams stumbled into their camp, they already had 105 birds. 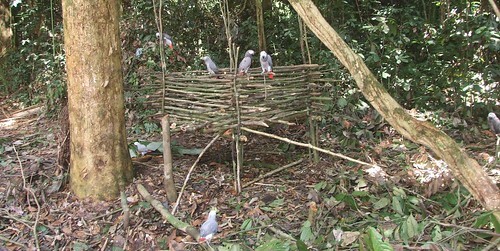 The capture method is to coat an arrow-like stick with the gluey sap of a local Sapotaceae tree, tether a decoy parrot next to the trap and wait for other social birds to settle onto the sham roost. A quiver of capture “arrows”. How long before Lomami’s parrot roosts and pigeon salt-licks are emptied? Whole forests in Uganda once rich in parrots, now have none. How much more time de we have to create this national park ? Is it Possible to Save Congo’s Parrots? African Grey Parrot Bust _ Now What? This entry was written by Terese Hart, posted on 2010-05-20 at 10:31 pm, filed under About the project. Bookmark the permalink. Follow any comments here with the RSS feed for this post. Post a comment or leave a trackback: Trackback URL. Please send your information to the World Parrot Trust. They have a FlyFree campaign and may be able to help you. 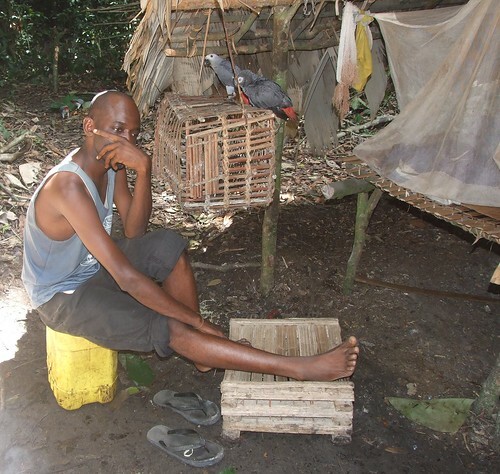 WPT assisted Limbe Wildlife Centre in Cameroon rehabilitate confiscated African Greys. Ugh, this makes me so angry for those poor birds. The big question is – what can the average person do to help the cause? We have started the AGAG group in South Africa (African Grey Action Group) We are currently still only on facebook but hope to have a website soon. We are looking for ways to stop the import of wild caught African Greys into South Africa. Please help with ideas as to how we can make a difference for these poor birds. Are there any educational programs in the Kongo re the plight of these birds?